It’s Yoshi’s birthday! I get to give birthday kisses to my Hunny! Check it out!!! I’ve got my party hat all ready to go! Whoo! 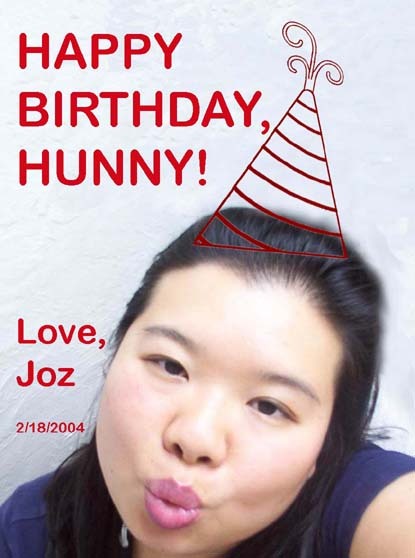 Come celebrate this special day with jozjozjoz & yoshi by making your own birthday hat with this handy, dandy template! Your pictures with a proper celebratory hat are welcome! Joz: Does your boycott include IMs? Why he puts up with me, I have no idea. GIANT LADYBUGS SERVING UP FRESH JOZJOZJOZ ON A PLATTER! That just about sums up all I can remember from my slumberly dreams last night. STOP CALLING ME A WUSSY GIRL! And though Yoshi tried to get out of it, I *did* get my kiss when I got home from work late last night. Of course, the kiss was quickly followed by, “Ok, I gotta go brush my teeth now,” but I got my kiss nonetheless. I kept telling myself it’d be funny once the aftertaste of kleenex wore off, but then I was visited by elephant-sized lady beetles oozing noxious leg juice while preparing to dine a small plate of jozjozjoz smeared with avocado. That’s what I get for reading about Ernie’s Asian Tapas before going to bed. No wonder I’ve been up & working since 5am. At least I didn’t die. The jozjozjoz.com archives for February, 2004.